Tonight I went with the flow of where everyone wanted to go to eat. 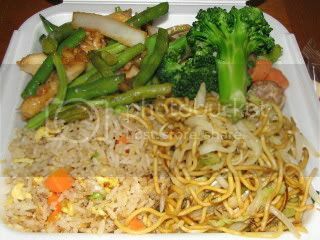 We ended up at Panda Express since we all couldn’t agree on a place 🙂 LOL….I LOVE Chinese food but I often prefer to make it since you can make it so much healthier. I was surprised to find that the nutritional stats at Panda Express are not too bad if you stay away from the known bad for you items. A bunch of crisp mixed veggies – steamed with soy sauce. 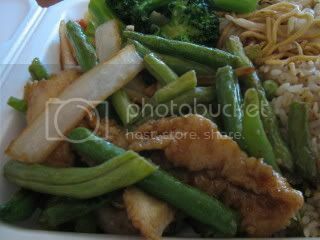 Plus some green bean chicken…LOVE this dish and it’s only 3 Weight Watcher Points! I might have also stole 2 bites of The Husband’s Orange Chicken and Mushroom Chicken. 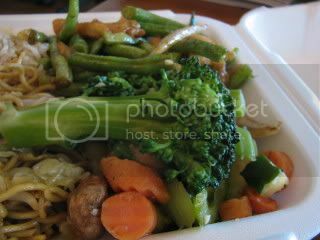 Doesn’t their Chinese food look pretty delish for being fast? I have to admit, it wasn’t half bad. Oh I had my fortune cookie too because honestly I EAT Chinese just for that little cookie with a message. Have you all noticed I have a thing for foods that talk to me yet? LOL…. It was a good night out with some fun bonding with The Husband and his Mom (Mother-In-Law sounds so formal). My Summer Dessert also got selected to be on FoodieView as a featured dish of the day – how cool is that?! Click HERE to check it out! Thanks again to EACH and EVERY one of you who has gone above and beyond in helping to VOTE! for me in the MyRecipes.Com Best Summer Desserts contest. I plan on posting what I’ve learned from this whole experience tomorrow. Ha! Have a great night ~ See you all in the morning! « Vote for me & help me win!!! That's so exciting about your dessert being featured on FoodView. Congratulations!!!! I love fortune cookies. Yummy meal! Sounds perfect! DEElicious! how funny, when i used to eat at panda (which was at least once a week) i would get orange chicken, mushroom chicken and half fried rice/half noodles!! it's pretty dang good for being fast food. i dont know if my tum could handle it these days but it looks good! Ada ~ I know – it's my first time ever featured on a recipe site like that – so cool! Have faith ~ Me too – total comfort all the way! Janetha ~ I need to get back to cleaner eats so then I will feel ick when I eat it again 🙂 It is good though. congrats of food review — you are such a blogging celebrity 🙂 autograph, please?